During a downpour in the rainforests of Southeast Asia, one sound you will not hear is the patter of geckos hitting the ground. Their sticky feet keep them adhered in habitats all over the world, from jungles to deserts to glass-windowed cities. Yet scientists have found that there is one way to loosen the lizards. Soaking geckos’ feet in water, or submerging the surface they walk on, defeats their sticky superpower—and gives new clues to researchers trying to replicate it for human use. Gecko feet have inspired much investigation and imitation by human scientists, who have found that the animals take advantage of attractions between molecules called van der Waal’s forces. These attractions are ordinarily very weak. But the soles of geckos’ feet are covered with tiny, branched hairs that end in flattened pads. This increases the surface area of the feet so much that the weak van der Waal’s forces add up to an adhesive power strong enough to hold a gecko upside-down on a ceiling. After placing the geckos onto the glass surface, the researchers coaxed them into taking one step at a time with a harness attached to their pelvis (Stark describes the geckos as "not necessarily cooperative" during this procedure). 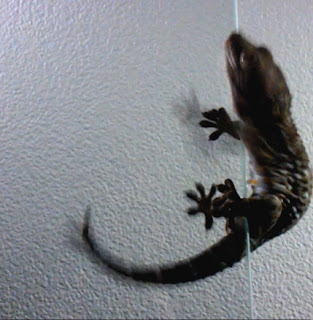 The harness was connected to a device that gradually tugged backward on the geckos until they lost their footing, measuring how much force it took to unstick them. The results, published today in the Journal of Experimental Biology, showed that water impairs geckos. When walking on a submerged surface, or with soaked toe pads, the geckos struggled to stay in place. It took much less force than usual to pull them free from the glass. When the geckos walked on a surface misted with water droplets—the condition that most resembled something the animals might find in their natural habitats—things got interesting. The geckos slid more than usual, but weren't totally defeated. “Even though they have lost a significant portion of their stickiness, they can still hang onto a misted glass surface,” Stark says. That water-repelling power on their foot pads, then, seems to come in handy. Getting soaked would unstick their feet, but geckos are able to prevent this in damp conditions by quickly shedding water drops from their soles. Stark now wants to find out how wild geckos behave in wet weather. Do they walk like normal and let their superhydrophobic feet do all the work? Or, to avoid slipping, do they stay away from wet areas altogether? Stark is not only a biologist; she's also a polymer scientist. So when she asks how gecko feet work and how the animals compensate for their shortcomings, it's because she's interested in ripping off their technology for human use. We're already well on our way. "Materials scientists have created many 'gecko-tape' synthetics that are reusable and sometimes work even better than the gecko," Stark says—in dry conditions, that is. Scientists at the University of Berkeley have built a gecko-inspired adhesive that lets a car drive up a precipitous incline (though only on a perfectly smooth "road") and, like gecko toe pads, self-cleans by casting off any particles that stick to it. In Germany, researchers at the University of Kiel created a gecko tape that can hold an adult human with just an 8-by-8-inch square. Other synthetic coatings and surfaces have been designed to repel water. Combining the two technologies to create a stick-anywhere tape that can handle a little water "would be ideal," Stark says. If we can figure out the trick, we can make adhesives that are more powerful and more versatile, she says—"in essence, more like the gecko."